This kit provides a fun, hands-on activity that utilizes techniques used by oceanographers and topographers to map sea floors. This kit provides a fun, hands-on activity that utilizes techniques used by oceanographers and topographers to map sea floors. Upon completion of this activity, students should have created a three-dimensional sea floor map, with which they can determine the type of land form in their section of the "ocean". This lab activity employs Framework Science Standards ESS1 and ESS2 (Earth's Place in the Universe, and Earth's Systems). This kit has been aligned with all published National Standards. Pre and Post-laboratory assessments and vocabulary words all target specific Science and Engineering Practices and common core standards. The teacher's guide and student copy master is included. This activity can be performed repeatedly with the materials provided in this kit and can be completed in approximately one or two 45 minute class periods. The kit includes enough material for 12 lab groups. Certifications: aligned with all published National Standards. 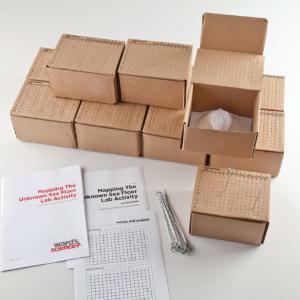 Ordering information: This kit contains 12 printed boxes each with a sea floor form and 24 Skewers. Cardboard for base of model, pens and markers, glue or paste, and scissors are required but not included.